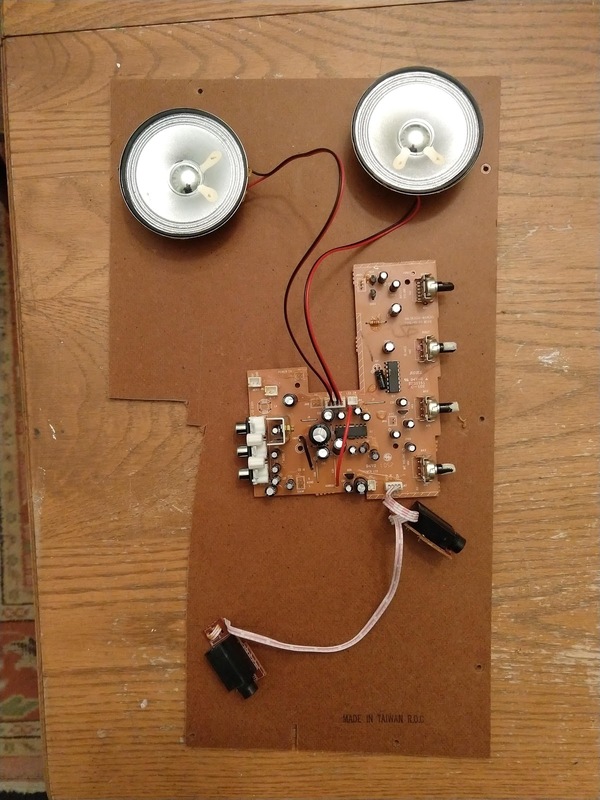 If you like experimenting with electronics, you might want to start going to thrift stores with an eye on things you can take apart and re-purpose. A while back, I picked up a Karaoke machine for $2.99 and transformed it into the amplifier (plus echo effect) for a DIY modular synth I made. 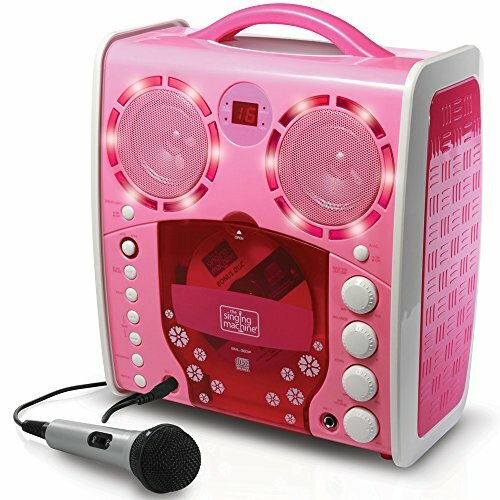 As it turns out, I can plug my guitar into this odd little device and have a lot of fun, too. In this case, I started by taking the device apart to see what was inside. 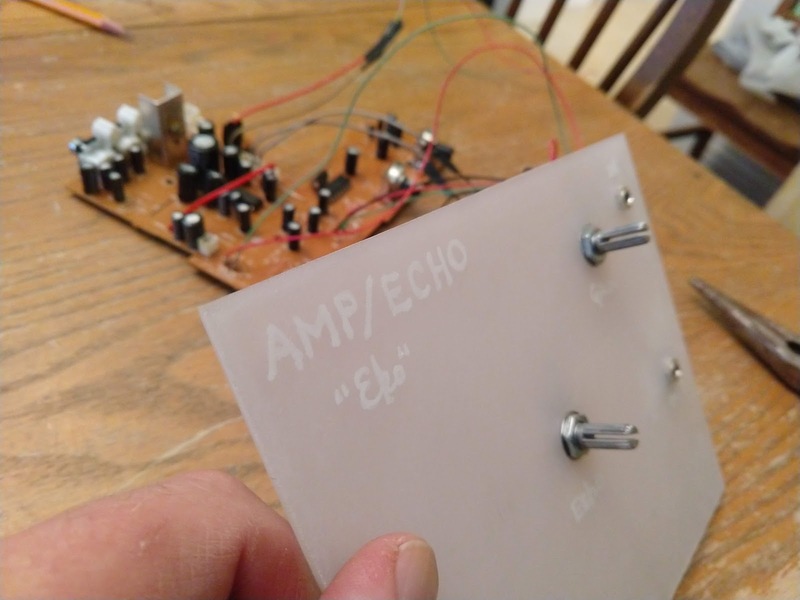 Since I couldn’t find (or yet understand) the datasheet for the echo processor chip inside, I decided to just take the parts as-is. 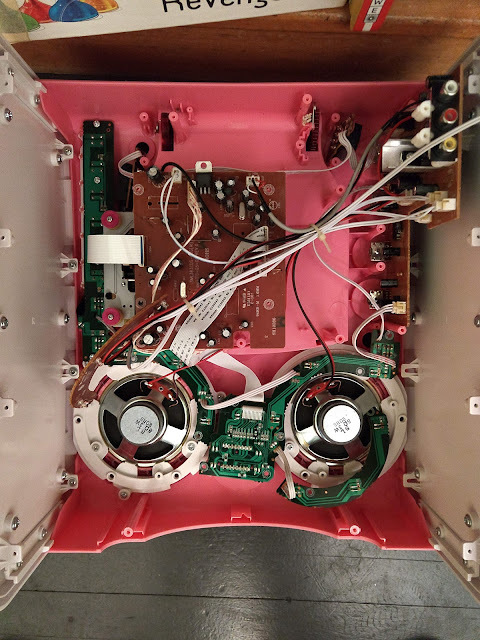 A view of the inside of the device. 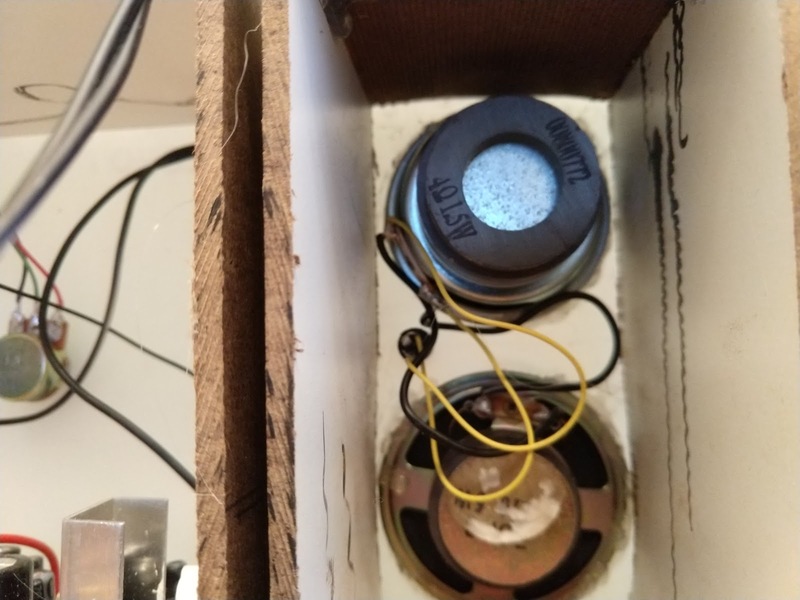 The initial salvage: main circuit board, speakers, and 1/4″ input jacks. 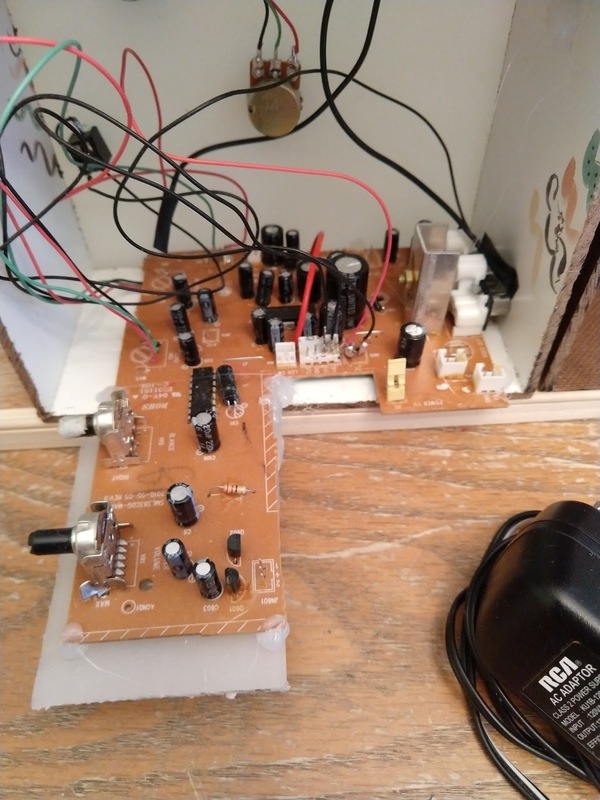 I had to figure out where the power went in and how the audio came out. I also had to figure out which features I wanted to use and control. Then, I needed to design an “interface” that matched my design vision. After testing a variety of pulled speakers (from computers and TVs, etc. ), I decided on this combo. I added a 3.5mm audio IN jack to match the OUT from my amp-in-progress. I kept/used some features and buried others. I attached a wall wart as the power supply and the rest is history. Now, the way I’ve done this is a little dangerous. Or, as I sometimes say, “potentially zappy.” No, it’s actually super dangerous to have all of this exposed electronic business. So please consider this a lab prototype (versus a recipe for injury-free success). 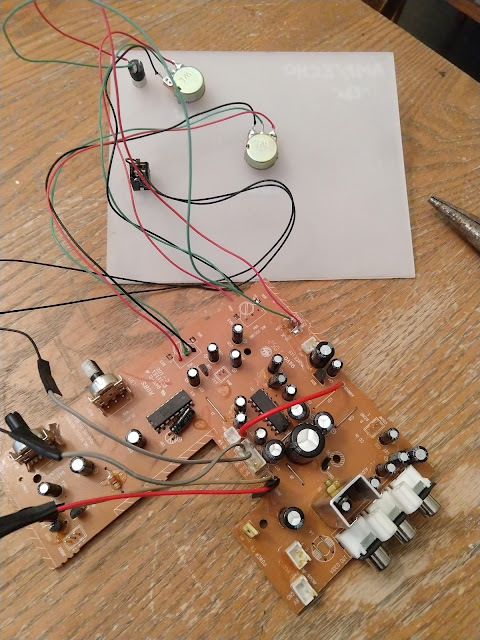 But hopefully this gives you an idea about how you can learn about and recycle some cheap item for audio- and music-making projects.